Thomas Merton's sessions with the young monks at the Abbey of Gethsemani showcase Merton's brilliant ability to survey the key figures and synthesize their writings, inspiring his listeners and readers with what it means for the spiritual life. Like its companion volume, A Course in Christian Mysticism, this book is a collection of fifteen lectures that get to the heart of Merton's belief that monastic wisdom and spirituality are applicable for everyone. This compact volume allows anyone to learn from one of the twentieth century's greatest Catholic spiritual teachers. 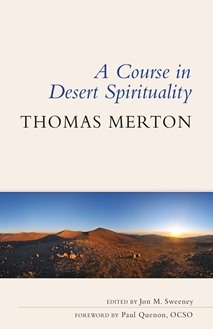 The study materials at the back of the book, including additional primary source readings and thoughtful questions for reflection and discussion, make this an essential text for any student of Christian desert spirituality. "In today's turbulent world many women and men . . . are looking toward Benedictine and earlier traditions for a guide on how to live. Here they are carefully spelled out again for our guidance." "A Course in Desert Spirituality offers keen insight into the wisdom of early Christian mystics like St. Gregory of Nyssa, John Cassian, and Evagrius Ponticus. It makes the Desert Mothers and Fathers come alive. But it also reveals much about the spiritual heart of Thomas Merton himself." "This fine book is filled with great insight and inspiration! Isn't it amazing that in this materialistic and superficial world, early desert spirituality would have so much to teach us today? And even more because it is filtered through the mind and heart of a true master teacher from our own time! This is very good food indeed." "This well-paced discourse on desert spirituality hosts just enough of an overview to be a course and just enough depth to be a dramatically impactful read. The work, followed by options for further reflection and discussion, makes for an inspiring personal or group engagement. Any reader of A Course in Desert Spirituality will undoubtably come away with new insights on both desert spirituality and one's own spirituality."